What would it feel like to be truly held during pregnancy, birth and motherhood journey? This is the question that today’s guest Samantha Huggins is answering through her work as a doula, childbirth educator and the cofounder of Carriage House Birth. On today’s episode, Sam shares her own journey towards becoming a mother, how she became a doula and why she wants all people to feel both held and free as they walk their own paths through motherhood and beyond. Samantha Huggins is the co-founder of Carriage House Birth. The premier doula agency providing birth and postpartum doula services, birth education, doulas trainings and more. 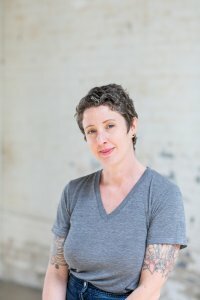 She is a Carriage House Birth certified birth doula, mother of two little kiddos, lactation counselor, childbirth educator and co-founder of The Code, a radical body literacy program for tweens. Her journey into childbirth began early, having spent the latter half of her teens in a community that supported people and their right to birth in safe and celebrated environments of their choosing. After devouring any and all media surrounding childbirth in preparation for the birth of her daughter, Samantha once again, found herself in a world nourished by belief in a person’s harmony with their body. Energized by her own supported birth experience and of those around her, Samantha decided to leave the America Museum of Natural History where she focused on emergency preparedness and response planning for research collections to pursue birth work. In doing so, she set out to achieve her goal to empower and educate other expecting people so that they might realize their own capacity to work together with their bodies in the symphony that is the bringing of life. When Samantha isn’t attending births, speaking publicly on birth, or teaching Carriage House Birth Foundation Doula Trainings, she unwinds with a yoga, meditation and time with her family and friends.